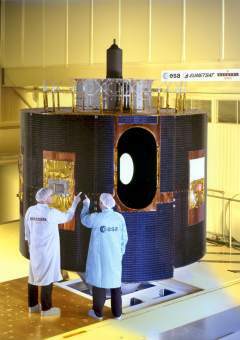 MSG-1 was the first in a new series of all digital European geostationary meteorological satellites to replace the Meteosat series detailed on another page. Like the original Meteosat, MSG is cylindrical and ‘spin stabilised’ – rotates around its main axis which is aligned nearly parallel to the Earths N-S axis at 100 rpm. The ‘spin’ serves two functions – to stabilise the satellite and as part of the Earth scan mechanism of the SEVIRI instrument. The considerable physical differences between the two series can be seen in the accompanying illustration. MSG scans the Earth every 15 minutes with an advanced SEVIRI [Spinning Enhanced Visible and Infrared Imager] radiometer which produces whole globe images in 11 spectral channels from visible light – VIS, to Infrared – IR, at 3 km resolution at the SSP and a selected area (including Europe) at high resolution visible – HRV with 1km resolution at the SSP. MSG satellites were originally intended to transmit two end user imaging channels, HRIT High Resolution Information Transmission at 1695.15 MHz which contains the full resolution 15 minute SEVIRI 12 spectral channel imaging and LRIT at 1691 MHz which contains a reduced resolution subset of 5 spectral channels of SEVIRI data plus relays of foreign satellite data - GOES E and W, Meteosat IODC and GMS/MTSAT imaging. The satellite also has a GERB instrument - Geostationary Earth Radiation Budget Instrument - the first time such an instrument has been flown on a geostationary satellite. Its data alone and combined with the SEVIRI data will provide vital new information on diurnal variations into the radiative balance of the planet. It will also have important applications regarding climate studies and monitoring. MSG satellites also undertake several other tasks including - Data Collection System - from aircraft, ships, platforms, balloons, etc. and Search and Rescue - to provide distress alerts and location information. Owing to the failure of MSG-1's transmission power amplifiers - see below, the above referred to data dissemination scheme has been superseded by the EUMETCast dissemination service - see separate information. After the successful launch and accurate placing of MSG-1 into geostationary orbit it was drifted to 10 deg. W and commissioning began at the end of September 2002. Testing of the LRIT downlink channel took place October 15th, 16th and 17th. But on the 17th the downlink ceased when the SSPA [Solid State Power Amplifier] in use unexpectedly switched off and was unable to be switched on again. MSG satellites carry four SSPA’s of around 10 W output for the three dedicated service downlinks, so there is a 4:3 redundancy scheme. One SSPA is allocated to the HRIT channel, one to be used simultaneously by the raw data and LRIT channel, and one for the DCP [Data Collection Platforms] channel. All commissioning was halted at this time and investigations into the failure were instigated. A Failure Enquiry Board looked into the amplifier failure, its consequences and to determine a safe mode in which to operate the satellite in the future. This took quite a time with checks on the same SSPA’s being made on the ground. During this time, however, the SEVIRI instrument was switched on around November 27th and the first full globe VIS image was received the next day. Results showed that the SEVIRI was working well and raw data downlinking appeared possible. Further imaging tests proved the SEVIRI instrument and the raw data downlink chain but a decision was made (later) that MSG-1 would not disseminate user services directly owing to doubt over the remaining SSPA’s and another method of MSG image dissemination would have to be found. EUMETSAT had been testing a new data dissemination service during 2002 in preparation for a new retransmission service providing atmospheric sounding data from sensors aboard NOAA polar orbiting satellites called EARS – EUMETSAT ATOVS Retransmission Service. ATOVS is a suite of atmospheric sounders aboard NOAA polar orbiting satellites. This service began on November 22nd 2002 as part of a service call EARS Multicast. Following the earlier possibility that MSG-1 would not be able to disseminate data directly to users, experiments were carried out of adding MSG data to the Multicast service. These tests were successful and EUMETSAT now had an alternative means of disseminating MSG-1 data. The Failure Enquiry Board advised at the end of 2002 that MSG could not be used to disseminate data to end users and it was decided to utilise the Multicast service instead – to which had been added Meteosat-6 Rapid Scan Service data. This combined data dissemination service would later be re-named EUMETCast – EUMETSAT’s Data Distribution System.